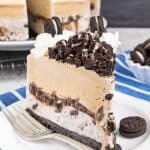 Layers of ice cream, cookies, and fudge make this Vanilla Mint Chip Ice Cream Cake a fun treat to share on a hot summer day. *Love these recipes? Be sure to sign up for the BruCrew email and have these recipes sent to your inbox each time a new one is shared. This weekend summer finally found us. We went from 60 degrees and wearing pants to 80 degrees and wearing shorts. A friend invited us over to do some swimming and chatting, and we got a little sun burn from just a few hours in sun and clouds. Woo hoo! It finally feels like summer! We even had some humidity on Sunday. That I can do without. Curly hair and humidity are not friends. One thing that we go through a lot of in hot weather is ice cream. I try to keep a few different flavors hidden in our freezer for those hot days…0r for when I want to create a fun frozen treat or milkshake for dessert. Yesterday at church I was talking with a few friends about how we all have to hide different snacks and treats from our kids, so they don’t devour everything in sight. All of us agreed that we had some hiding spots that the kids have figured out. Finding some new hiding spots is definitely needed. My friend Jeanna suggested that we should try hiding the treats inside other containers. Just think about it! You know those big bag of green beans at Sam’s Club? Save that giant plastic bag for those ice cream containers that you want to stay hidden a little bit longer. The kids will just think you bought more green beans and won’t touch it. Haha! Sneaky, sneaky! Or save the boxes that garbage bags come in for those cookies and candies in the cupboards! This is going to be a whole new game changer for my baking cupboard! Mwhahahaha! 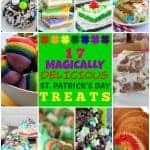 I can’t wait to hide all the sweets! Except that I will probably forget where I hid everything and end up buying more…or blaming someone for eating them. Luckily our kids are really good about not taking food without asking for it first. They know that their mom is a psycho baker who likes to sugar coat sugar. When I bought the ice cream for this cake, I made sure all three of them knew it had other plans. But I knew that wouldn’t stop them from asking when I was done with it, so I put together this fun cake the next day. Our daughter actually came up with the idea for this cake. She always asks for mint treats on her birthday, and this year was no exception. 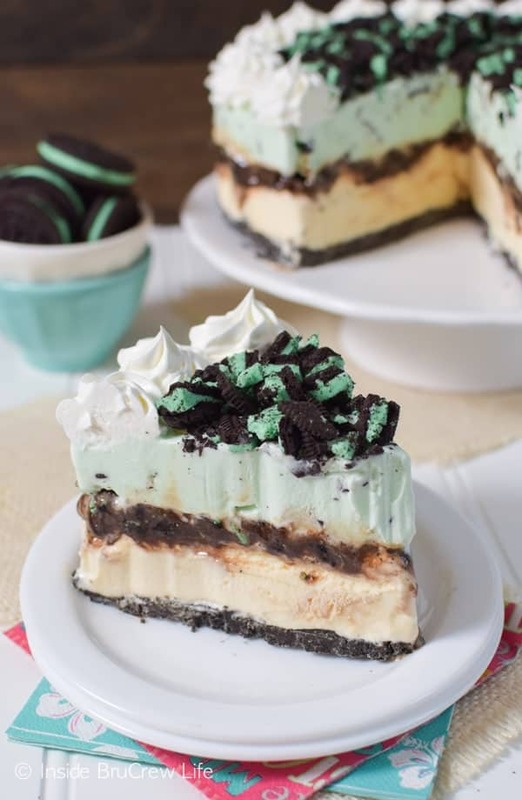 She wanted mint chip ice cream and mint cookies layered into an ice cream cake. She and I talked it through and came up with 2 layers of ice cream and a fudge cookie center with more cookies on top. This girl and her fun treat ideas make me so proud! She is following in my footsteps…now if only she would follow me into the kitchen and actually help bake some of her creations. Baby steps, right? 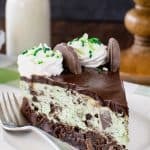 Layers of vanilla and mint chip ice cream with a hidden fudge center is a great way to do cake on a hot summer day. Combine the cookie crumbs and melted butter. Firmly press the mixture into the bottom of a 9-inch spring form pan that is lined with wax paper. Refrigerate. Place the vanilla ice cream on the counter for 20-25 minutes. Stir until smooth but still frozen. Spoon onto the crust and smooth out. Place in the freezer for 30 minutes. Stir together 1 cup cookie chunks and hot fudge. Spread over the vanilla ice cream. Place back in the freezer. Place the mint chip ice cream on the counter for 20-25 minutes. Stir until smooth but still frozen. Spoon gently onto the fudge mixture and smooth out. Freeze for 6-8 hours or overnight. 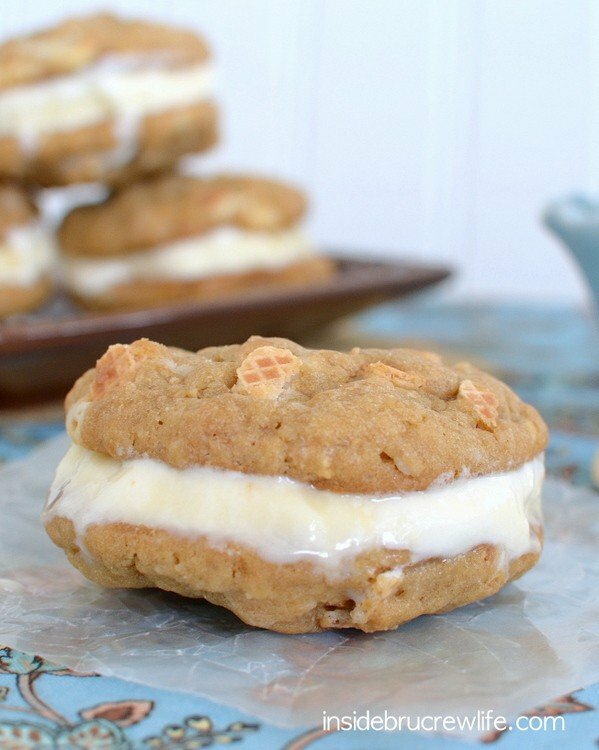 Pipe the Cool Whip around the edges and fill the center with the rest of the cookie chunks. Cut into 12 slices. Store in the freezer in a covered container. I am so glad the summer weather is finally here! And this cake looks like the perfect treat to indulge in. Love the mint flavor, Jocelyn! Sounds so delicious! We were so happy to see the warmer weather too…too bad it didn’t stay. This looks delicious and cool. I’m so glad it finally warmed up for you! Oh, do tell me more about these hiding spots! I’m all ears for new places to stash my sweets! LOL! I always hide treats from my kids and my husband! Two of my kids are born on the day and I always have to make two separate cakes for them. I just showed them your cake and they actually BOTH want the same cake now! That hasn’t happened in 11 years 🙂 So thank you! Woo hoo! How cool is that! I shared that with my daughter since it was her cake idea and she thought that was awesome!!! I hope they enjoy it! This cake looks so indulgent! Love the mint flavor! It’s the perfect treat to cool down with on these hot summer days. Thank you! 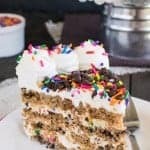 Ice cream cakes are perfect for hot summer days for sure! I think you have another food blogger in training! And I’m LOVING the ideas for hiding spots. That’s genius! Yeah, we had a few warm days and then back to cooler days again. This has been the craziest summer ever!!!! Yum, this cake looks perfect for summer! Love it! It’s been raining so much in PA, I think I finally did get a little sun this weekend when it stopped raining. Saturday was one full day without rain. Then it rained on Sunday. Rained again today. Probably more rain tomorrow. Summer where are you?! 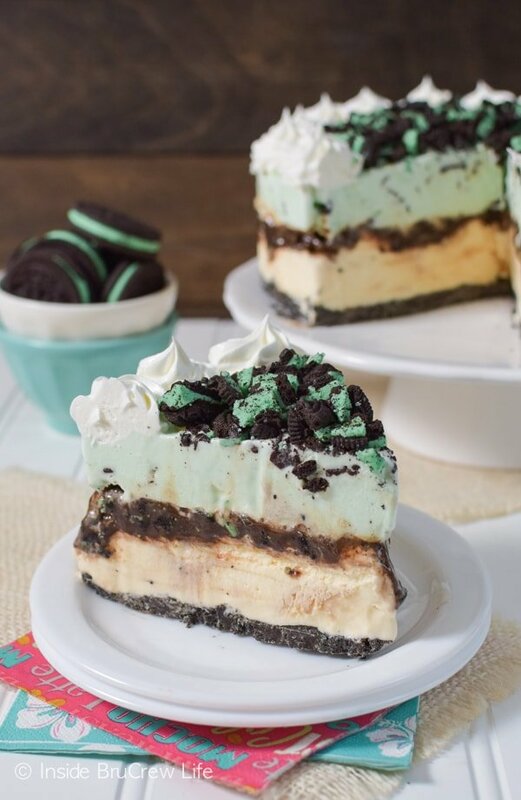 I think I need a slice of this ice cream cake to cheer me up. I have been calling for summer for the past 2 months too! Where oh, where is the hot weather? It will probably be here in 3 weeks when the kids go back to school! Oh my heavens! 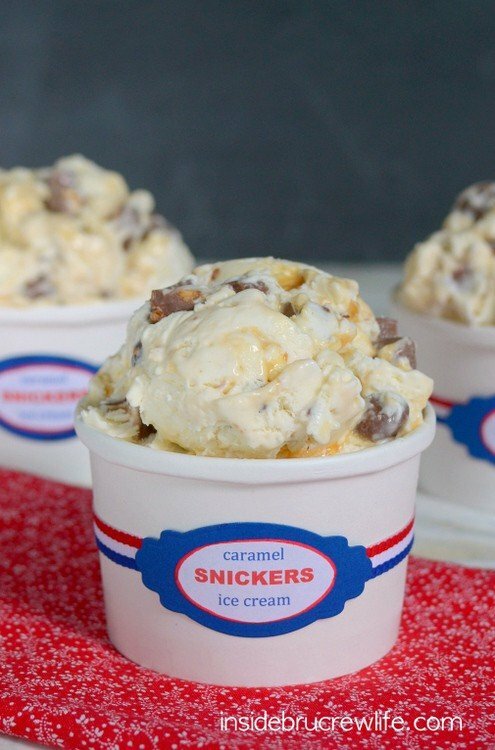 What a decadent ice cream treat! I am loving this idea! 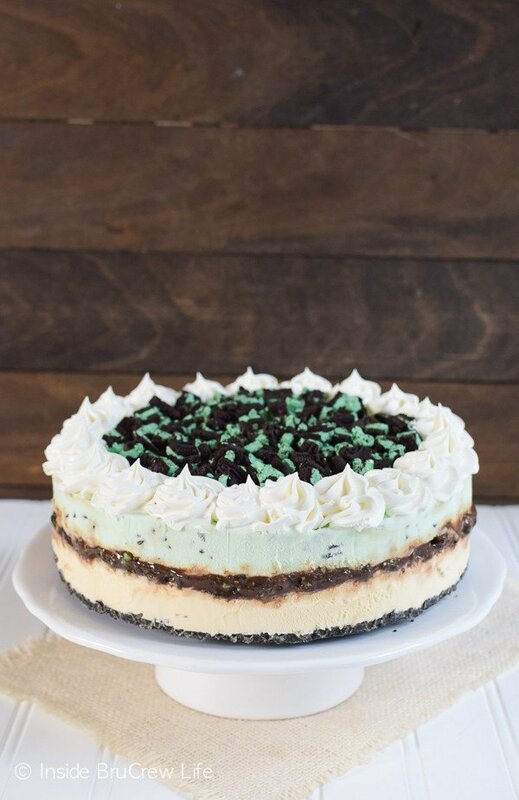 Yay, so glad you are finally getting warmer weather 🙂 This ice cream cake is the perfect treat to cool down with! Love the flavors in here and the layers are so so pretty! 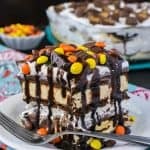 I am obsessed with ice cream cakes lately and you make the most amazing ones! Keep them coming! Pinned! Thank you! I’ve kind of gotten obsessed with making them too…I have another one to share some time soon! 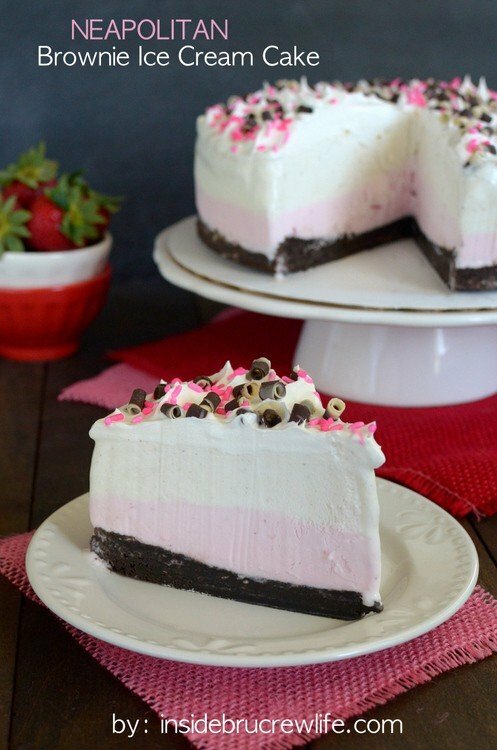 Goodness gracious do I love ice cream cakes! That vanilla mint chip-sounds so yummy. omg the green bean bag is a genius idea for hiding ice cream! 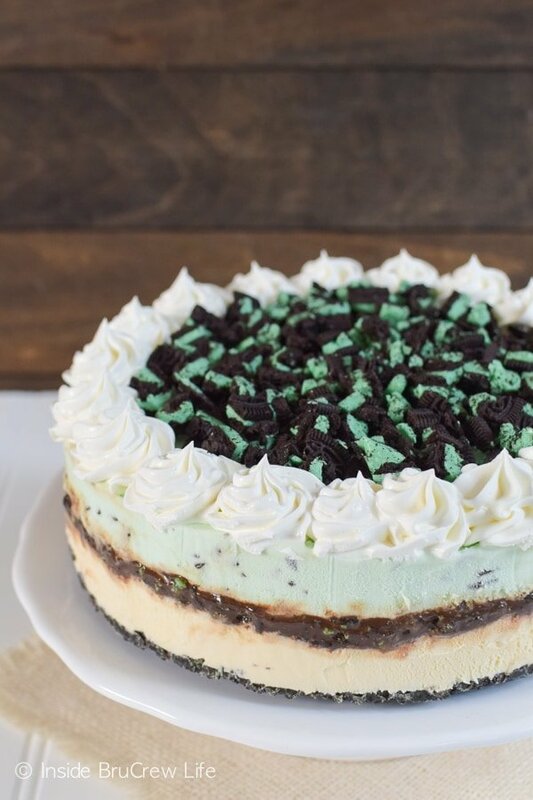 This ice cream cake looks so delicious too! Hahaha! Isn’t that the best idea ever to hide treats in the freezer?!?!?! I’m totally going to do it!!! 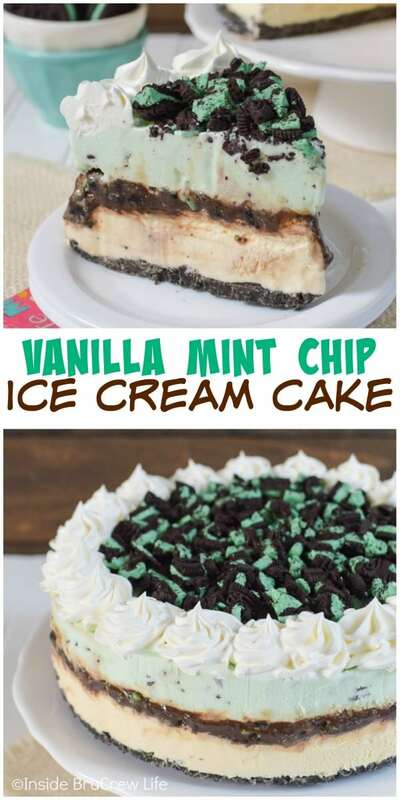 Mint chocolate chip has always been my favorite and what a genius use for those mint filled cookies. Love! Hahahahaha! Ok, that is stinking hilarious!!! I love that he was so proud of himself for not getting into your stash of sweets! LOL!!! Thank you so much Joan! I hope you enjoy it…although I do recommend sharing because it’s pretty rich! LOL! 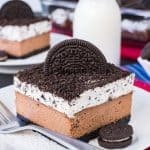 Love the hiding tactics (smile) and I love this ice cream cake! Mint CHOC chip ice cream has and always will be a favourite of mine! That’s genius! I hid food as well but never thought about masking it with vegetables. My closet has become a state of confusion…food, confiscated toys, future birthday gifts. It’s completely insane in here! I’m a huge mint fan. This looks fantastic! This cake looks like a summer dream!!!! I need it in my life! !